What are the secrets to maintaining a healthy brain? According to a first-of-its-kind index, it may depend on where one lives. Those living in Washington, D.C., can consider themselves among the healthiest “brains” in America. 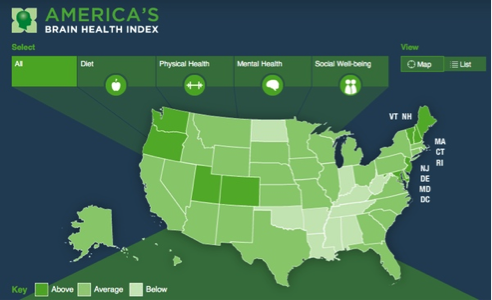 America’s Brain Health Index evaluated the 50 states and the District of Columbia, based on 21 brain health indicators in the areas of diet, physical health, mental health and social well-being. Check out how each state ranks! Live life to the fullest: Intellectual curiosity, pursuit of education, reading, learning new activities and skills and even playing games are fun and easy ways to exercise your mind. Feed your body and brain: Maximize your intake of DHA, the omega-3 fatty acid that makes up 50 percent of the brain and is a must-have to support lifelong brain health. Find DHA in fatty fish such as salmon and trout, along with algal DHA fortified foods like juice, milk, eggs, tortillas, yogurt, and algal DHA supplements, such as Algal-900 with life’sDHA. Maintain your mental muscle: Engage in physical activity for at least 30 minutes a day to encourage new brain cells and connections. Walk, play sports, take the stairs instead of the elevator, or do something you enjoy outdoors. Become a people person: Stay socially connected so you feel like you’re a part of something — the workplace, clubs, a network of friends, a religious congregation or a volunteer group. Take our Brain Health Quiz and challenge your friends and family to test their brain health, too. Comment below and let us know what you do to care for your brain. Next Post Celebrate Earth Day this Sunday, April 22! Chia seeds are a great source of omega 3s and super easy to incorporate into your diet!